The final count is in, and I read 63 books in 2014! I was pretty surprised when I saw that number - I think that is my record for books read in one year, at least since having kids! Usually at the end of each year I do a "books I read" list, but 63 is a lot of books, so I'm just going to tell you my favorites from the year. I was trying so hard to stick to ten, but there are actually 11 here - I just couldn't narrow it down! In no particular order . . . I Will Carry You by Angie Smith - Oh my goodness, from the moment I picked this book up I just could't put it down, and I cried through the whole thing. I usually don't like to cry, but the way Smith tells the story of losing her fourth daughter is so beautiful and touching that I had to include this one. The Politcally Incorrect Wife by Nancy Cobbs and Connie Grigsby - This book takes a tough subject for many Christian women to swallow - biblical submission - and makes it understandable. I was convicted and challenged by this book, and I'm thinking I need to read it again. I'm No Angel by Kylie Bisutti - This book is written by a former Victoria's Secret "Angel". I thought it was interesting and it opened my eyes to the dark sides of the modeling industry. Very enlightening. What To Expect When No One's Expecting by Jonathan V. Last - This book discusses the social ramifications of recent generations having less children. This book made me laugh, made me think, and made me want to have more kids. Rush Revere And The Brave Pilgrims by Rush Limbaugh - I love Rush, so I had to read one of his new children's books! And I have to say, I was so impressed. This book is fun and I can see how kids would love it - and they can learn solid history in the process! Regardless of what you think about Rush, this book is a great way to teach American history to kids. Seeking Allah, Finding Jesus by Nabeel Qureshi - This book is Qureshi's testimony of how he went from being a devoted Muslim to a Christian and an apologist, and it all started with a college friendship. I couldn't put it down! Dug Down Deep by Joshua Harris - This book is an overview of basic theological concepts, and I thought it was so well-written - it made me want to dig deeper into theology. I could also see how much Harris has grown up since "I Kissed Dating Goodbye". Compelling Interest by Roger Resler - This book basically covers the legal history of Roe v. Wade, and how it has impacted culture. I never knew the facts of that case, so it was fascinating to me to read how it all went down. I am pro-life, and though this book is written by a pro-life author, I think it would be interesting for anyone to read. America: Imagine A World Without Her by Dinesh D'Souza - I am unapologetically conservative, and if you are more liberal leaning, you would probably hate this book. I loved it though. It explained so many concepts that had been a little fuzzy to me. I thought the way D'Souza analyzed historical events was fair, and his summary of the current state of the country was very interesting. Directed Verdict by Randy Singer - Singer writes law fiction, and he has been compared with John Grisham, only he writes from a Christian perspective. I always enjoy his books, but this one is probably my favorite book of his! Fatherless by James Dobson - If you follow me on Instagram, you've already heard me mention this one - this is a fiction book that follows the current trends relating to families into the future, to their inevitable conclusions. It was a subtle dystopian novel, but it was made more terrifying to me because I can actually see these things happening! So interesting, and I couldn't stop reading. A Broken Kind Of Beautiful by Katie Ganshert - I didn't read a lot of fiction that I loved this year, but this is one from the bunch that I really enjoyed. The story was good, with an understated romance, and I like Ganshert's writing style. To see all the books I read in 2014, check out my 2014 Goodreads shelf! What was your favorite book from 2014? Any recommendations for me for 2015? A Thing Of Beauty by Lisa Samson is a story about a child actress, Fia, who finds herself a hoarder as an adult after a particularly traumatizing childhood that ended when she "divorced" her parents. With her mother about to put out a memoir that will tell all the unpleasant details of her younger years, Fia takes a single boarder in her cluttered house, in order to earn extra money to make it look like she still has it all together. Josia, the boarder, starts turning her houseful of junk into beautiful things, and Fia does the same with all the once-broken pieces of her life. I have to say, I was disappointed in this book. The plot idea had such potential, but the author ruined it for me with around 30 curse words. I was surprised to see so many curse words in a book that is from a Christian publisher. This book is not Christian in any way - the story line doesn't talk about God at all, and while there might be some sort of allegory potential there, it seems like a stretch. I'm honestly pretty surprised that Thomas Nelson chose to publish this book. I don't get it. This book is written from a first person perspective, and while the main character is multi-dimensional and interesting, I'm not sure I particularly liked her. I also thought some of the narration was a little awkward - the word "okay" was thrown into sentences here and there, and while I think it was supposed to be conversational, I didn't like it. In many ways, this book was depressing to me. While the character's initial hopeless attitude improved throughout the book, and a couple of her relationships improved, one of them was cut off completely, with no hope for a future reconciliation. The main character was also abused as a child, and the description of the moles.tation incidents painted a picture I didn't necessarily want in my head. The hatred for the horrible person who did that to her was fresh, and while she achieved some closure through a conversation with her father, it all just added to the depressing aspect for me. The final lesson seemed to be that you can find your own happiness in life if you just choose to, and while I suppose that is not a bad lesson, per se, it wasn't what I was expecting at all. I was just disappointed. I think one of the hardest things about being a working mom is that initial time of going back to work after your baby is born. Maternal instinct is a powerful thing, and it can be pretty stressful leaving your baby for the first time. I have gone back to work after baby three different times now, and it was always important to me to make that day as easy as possible on myself and my new little one. 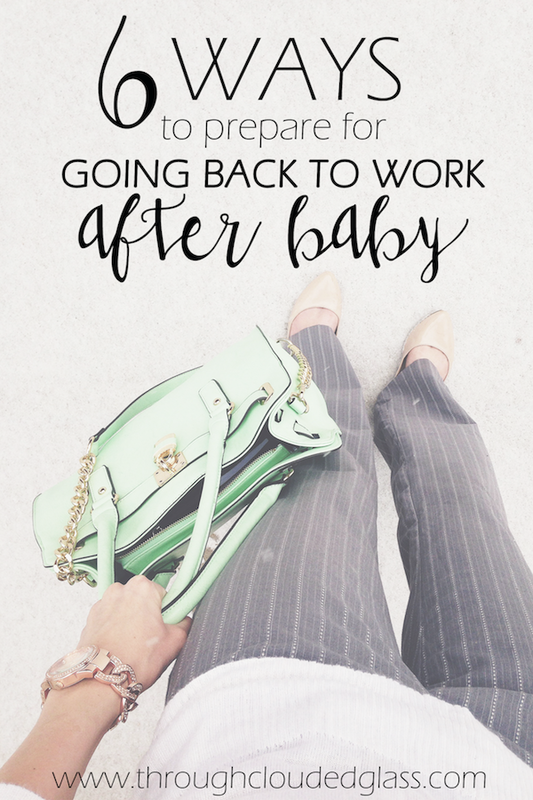 There are a few things I would suggest if you are planning on going back to work after having a baby. 1. Take full advantage of your maternity leave. I think there can be a lot of pressure on new moms to go back to work as soon as they can after baby, but I recommend taking your time. You are never going to get these new days with your baby back. Take as much time as you can to just get used to this new person in your family and bond with your baby. 2. Get your baby used to a bottle. Unless you are able to dive out of work every few hours to nurse your baby, your little one will have to be given a bottle. It can be hard on some babies to get used to taking a bottle when all they have done is nurse, so it's good to start trying to get them used to taking an occasional bottle before you plan on returning to work. 3. Do a trial run. One of the hardest things about leaving your baby is . . . well, leaving your baby! The first time is always the hardest, so I think it is a good idea to make sure that first time is not on your first day back to work. Ask your caregiver if you can bring your child over for a trial run for a couple hours - this way you can make sure both your baby and you are comfortable with the care situation before that first day. 4. Work out pumping time. If you plan on continuing to breastfeed after you start work, you will need to work out some time to pump at work. In some jobs it might not be a problem to take a fifteen minute break every few hours, but jobs where you are scheduled may require a bit more planning - so make sure a plan is in place well in advance! 5. Prepare the night before. You don't want to spend your first morning back at work rushing around, trying to gather everything you and your baby need for the day. Get everything ready the night before you go back. Make sure your pump is charged and all pieces are accounted for, make sure the diaper bag is packed, set out clothes for you and your baby. I still do this every work night, and it makes our mornings go so much smoother! 6. Give yourself a little grace, and trust God with your baby. Some mothers may be able to transition seamlessly back into a work environment, but for others it can be an emotional experience, especially if it is your goal to someday stay home with your child. It's okay if you feel like crying! Bring your mascara for touchups, and spend some time in prayer on your way to work, putting your baby in God's hands. Going back to work after baby can be difficult logistically and emotionally, but it is easier when we can give the Lord all our worries. This isn't the last time you will need to trust Him to take care of your child. Get all the emotions out, give Him all your anxieties, work out all the details in advance. Then rest in His peace and represent Him well where He has you right now! Show His love and grace to all those your encounter as you go about your work, because He has you working right now for a reason. 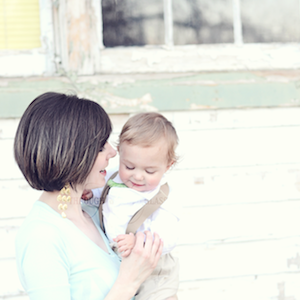 For more reading for working moms, check out my post on Tommy Nelson today - I'm sharing a letter and prayer for working moms! Growing up I was never bullied by anyone, per se. The worst experience I had with other kids was a time when I felt like I was being made fun of by some kids in my class. The next week, I tried on a million different outfits and ended up crying in the bathroom to my mom because I was sure that no matter what I wore, the kids would make fun of me. She let me stay home that day, but the next time I went I was laughed at for something again. I went home and cried in bed that night while my mom tried to console me. My brother came in, and I remember my mom pointing to me and saying "See what those kids are doing to your sister? You don't ever laugh at anyone or make them feel like this, do you understand?" And I think he did. Even though being laughed at was pretty traumatizing to my 9-year-old self, I can't even imagine what it must be like for kids who are maliciously bullied. I find it so disturbing that bullying seems to be such an increasing problem today, and it makes me scared for my own kids. 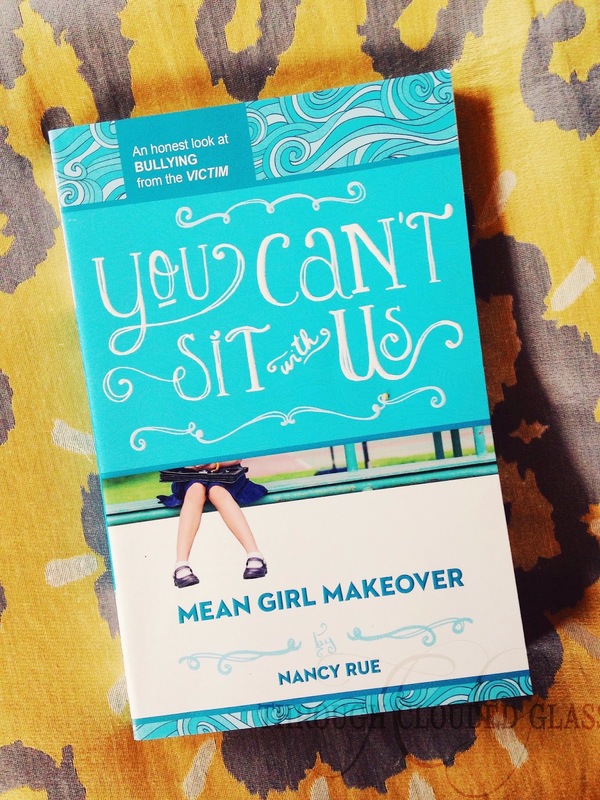 That's why I really appreciated the book "You Can't Sit With Us" by Nancy Rue. This story is about a girl named Ginger, who is manipulated and bullied by a girl in her class named Kylie. The story line shows how bullying can affect kids, but it also shows ways to fight against bullying and help your kids resist it. I think this would have been a book I would have loved when I was younger! The one thing I wasn't crazy about in this book had to do with a lesson Ginger learns about God not causing bad things to happen to her. I think the author was trying to address the "if God is good, why do bad things happen?" question, but I think her wording made it sound as if God is not in control of everything - and we know that He is. God is sovereign, and He works everything out for the good of those that love Him (Romans 8:28). I didn't really like the way the author explained that issue, though it is a tough one to tackle. I feel like this is one topic that should be discussed in further depth with your kids, for clarification. I wasn't satisfied with how the book left it. Overall, I think this book is one that middle-grade readers would enjoy, and I think there are a lot of great conversation starters in these pages. I would recommend parents reading this book with their kids, so the issues it addresses can be discussed between parent and child. To me, starting conversations is the real value in this book. If you would like a chance to win a copy of this book for your child, you can enter by filling out the Rafflecopter form below! Prize is provided by Tommy Nelson, and this giveaway is open to U.S. Residents only. Clyde is now nine months old! This month Clyde weighed in at about 17 lbs at his office visit. He is in 6-9 month clothes, but probably not for much longer. H e is a size 3 shoe and a size 3 diaper now. This last month has just been so fun - Clyde got both of his lower teeth in right around Thanksgiving, and his two upper teeth came in right at Christmas! I think his little tooth grin is the cutest thing. He isn't crawling on all fours yet, but he is starting to scoot crawl. He has been sleeping through the night much more often, so I think we are finally past the eight month growth spurt! His big thing this month is looking at people's teeth. Anytime I pick him up he just grins at me and tries to touch my teeth. I can't talk without him sticking his fingers in my mouth. There have been times when he gets both his little pointer fingers hooked in my mouth, and he has such a serious look on his face that he reminds me of a little dentist! You never know. His laugh has become even more cute, if that's possible. He has such a cute little belly laugh, and then he ends on a hiccup laugh, and I love it. He laughs most when someone "surprises" him (he likes it best if he knows the "surprise" is coming. Clyde has always hated being alone, and it is still that way - if he thinks everyone left the room, he gets upset. He likes to see where everyone is. He is thrilled when Gwen and Wyatt come over to play with him, and they are so good with him. Clyde is really into his toys, and he loved all the new ones he got for his first Christmas! I am still his favorite person though - if he has a choice, he'll choose me to hold him, though he okay with other people too. But if he can see me, he would rather have me holding him. If I am gone during the day at work and he doesn't get some quality time with me before bed, he doesn't sleep well. I think he fusses at night sometimes just because he wants me to come hang out with him. I remember Wyatt and Gwen having stages where they wanted to be with me most, but Clyde's has definitely lasted the longest. I have to say, I love it! I love that he knows I'm his mama and wants to be with me. It melts all those little places in my heart. If he is my last baby, I am so glad that likes to hang out with me best, and I am going to enjoy every second of it - even the midnight seconds. What a cutie you are! It's hard to even describe how adorable you are, and your little grins and giggles make my heart jump. I love that you like to hang out with me, and I love what a cheerful little guy you are. Lately when you are happy to see me, you give me your classic, four-toothed grin, and then you scrunch your nose. Sometimes you smile and give me a little eyebrow raise, like we have some fun little secret between us. And I get that little leap of joy somewhere inside. I love you sweet boy. I am so glad you are mine. 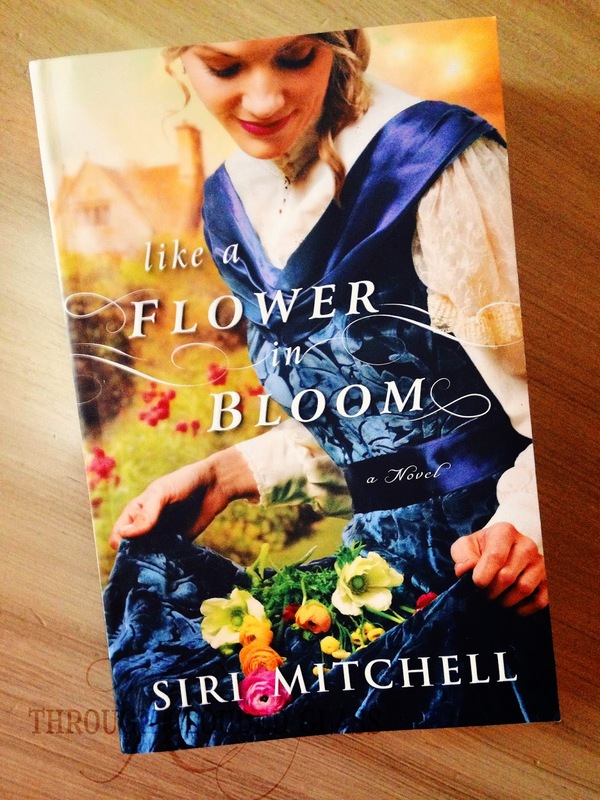 I have read several of Siri Mitchell's books, and I have to say, I love how well-researched her historical fiction is! "Like A Flower In Bloom" was no exception. This book follows the story of Charlotte Withersby, a young lady who aspires to be a botanist, as her uncle and father decide it is time for her to put botany aside and find a husband. Mr Trimble takes over as botany assistant to her father, and she soon concocts a plan, along with a new friend, to get rid of Mr. Trimble. This book was set in an era a couple generations from Jane Austen, but to me it has that same sort of feel as on of Jane Austen's books as we follow Miss Withersby as she enters "society" in England. I also loved the romantic maneuvering and human nature angles that Mitchell included in this story. Although I found myself getting irritated at Miss Withersby's arrogance at times (maybe she was just supposed to be naive, but her character also seemed a bit arrogant to me), I still thought she was pretty lovable. I wish that through the story she had recognized that maybe she doesn't know best about everything, but I still thought the ending was satisfying. I found myself laughing throughout the book, and I think it was a very enjoyable read! If you like historical fiction or Jane-Austen-esque fiction, be sure to check this one out! Over a year ago, I was reading a book on fashion when I had a punched-in-the-gut moment. I wasn't actually punched in the gut, it just kind of felt like it. You might be wondering how a book on fashion could make a girl feel that way. Did I realize how horribly unfashionable I was? Did I find out my favorite pair of pants was so "last season"? Perhaps I should back up. I had recently heard of a book called "You Are What You Wear: What Your Clothes reveal About You". Can you believe that my pastor quoted from it? The premise sounded interesting, and I like fashion and clothes as mush as the next girl, so I picked up a copy. I started the book and read the introduction about the "psychology of dress". So far so good, and the book was interesting. Little did I know the next chapter would hit home in a way I wasn't expecting. I read about a woman who was in debt because of her tendency to buy things she didn't need. I didn't relate. I don't spend money I don't have on clothes. But then the author started talking about reward centers, and dopamine surges associated with finding the perfect item, and self-soothing, and I came to a disturbing realization. I was addicted to shopping. Today the term "shopaholic" is thrown around as something funny or charming, but all of a sudden I hated that word. As I read, my patterns of behavior became all too clear to me. When I was stressed about something, I would treat myself to a new bottle of nail polish. When I was unhappy with being alone so much (Derek was traveling a lot at the time), I would pack up the kids and update our wardrobes. When I felt bored or sad, I'd buy something new for the house. I was so disturbed by this that I mentioned it to a few people, and some assured me that it wasn't that big of a deal. I wasn't spending money I didn't have - so what was the problem? The problem was that it wasn't just about not spending too much money. I knew deep down that I was self-medicating with boots, and blouses, and throw pillows. I recognized the boost I felt when I got something new. It made me feel like I had something to look forward to, like my life was a little more exciting again. I didn't like the idea that I was self-medicating with things. I was trying to fill a hole in my life with material items. The problem with this is that the satisfied feeling never lasted very long. The next time I didn't feel good about something in my life, I had to buy something else to give me that temporary "high" again. But what hurt me most was that I realized that this "addiction" of mine was hurting my relationship with Jesus. I should have been letting Him fill up the empty places. I should have been taking my worries, stresses, and sadness to Him, instead of giving myself temporary relief by buying something new. I should have been drawing my comfort from the Word of God, instead of material possessions. In a very subtle, socially acceptable way, I had been putting clothes in a role that only God was made to fill. There is a reason shopping highs don't last very long. It's because shopping was never meant to be my comfort. God was meant to be my Comforter, and I had accepted a cheap substitute instead of being satisfied by the comfort that only comes in Him. I had to stop and ask for forgiveness right then for letting things replace Jesus. And it hurts me even now to type that, because I hate the thought that I ever thought they could. I'm not saying I'm completely over my shopping addiction. I still struggle with emotional shopping, and there are times when I still give in. I am so grateful for the grace He gives as I work on this. I am trying to remember that material things will never fill my holes. I need to fill my mind and heart up with the truth of God's Word, with the love and grace that He is always ready to pour over me. When I am filled up with Him, the temptation to try to fill the holes in my life with other things fades. He is the only One that can truly satisfy. Sometimes I get nervous when I start a new book, because I don't necessarily know what I am in for, especially when it is written by an author I don't know much about. That is kind of how I felt when I started 52 Weeks With Jesus by James Merrit. I didn't know what kind of book this was, or whether I would agree with the author's thoughts. But I have to say, my nerves were soon calmed! This book is a devotional-type book that is meant to take you through an entire year. Each chapter addresses a different story about Jesus from one of the gospels, including verses for reference, thoughts from the author, a prayer to close, and a question to consider. I had never heard of this author before, so I was on the lookout for anything fishy through the whole book, and I thought everything he said was theologically sound. The only thing I wished for was a few more references on some of the historical background Merrit gives on some of the stories - that would have made this book even more solid, in my opinion. The author has an easy-to-read style, and he includes a lot of illustrations, which I really enjoyed. I thought his examples and stories tied things in very well, and it made each chapter interesting to read. I loved the insights Merrit gives into the history and cultural context of Jesus's words, and he pulled points out of many of stories that I had never thought of before. Overall, I think this would be a great devotional and Bible study aid, and it would be perfect to start for the New Year! I recommend it. Note: I received a digital copy of this book for free from NetGalley in exchange for tho review. This is my honest opinion. Exploring Christian Theology Vo. 1, by Michael J. Svigel and Nathan D. Holsteen, explores the theological topics of the divine inspiration and inerrancy of Scripture, and the Trinity. If you are looking for light reading, this isn't it! But I loved delving deeper into these doctrines of the Christian faith. The book is split into two sections, one for the divine inspiration of Scripture, and one for the doctrine of the Trinity. Each section is further divided into chapters that are written by different authors, including sections on passages of Scripture to master, dangers to avoid, principles to put into practice, and recommendations for further reading. Everything in this book seemed to be really biblically accurate and doctrinally sound. There was one sentence (I believe in a quote) that referenced the idea of the perpetual virginity of Mary, which is not biblically based, but the authors didn't take a stance on that one way or another - everything else seemed to be spot-on. This book will keep you thinking, and though I had to hurry to finish it so I could post this review, I think that it would be a great resource for further study. I also loved that they gave resources for further reading related to each of the topics they discussed, so if you are interested in digging deeper into either of these topics, it sets you up perfectly for that. I think it is always good to come back to the cores of our beliefs as Christians, and this book covers these first two topics beautifully. If you are interested in studying theology, I think this book is good resource to use to start. I don't think I can really explain my word for this year without recapping my word for 2014 first. For 2014 I picked the word "invest", and I wrote about how I wanted to invest my time and energy in things that matter - particularly in people and my relationship with Jesus. And I have to be honest, I don't think I did that great of a job. I had all these ideas of things I wanted to do, and relationships I wanted to build, and throughout 2014 I just felt . . . busy. There were a lot of things demanding my time and energy, so I felt like I hardly had time to really invest the way I wanted to. When I was thinking about my 2015 word, I just kept thinking that I would like a re-do of the word "invest". But honestly, I would probably come up with the same result. That's when my new word came to mind. The reason I felt like such a failure with "invest" was because at the end of the day, I had very little left to invest. My schedule, my house, my to-do list were so jam-sacked that I just didn't have enough extra to give - and I hate that. I hate running myself so ragged that I don't have enough of . . . me left over to spend on eternal things. So I realized that I got things a little out of order last year. In order to be able to invest my life in the things that will last, I need to simplify first. In a way, I am giving myself a do-over on investing, because I want to simplify things in my life so that there is enough of a margin left to be able to invest in things that matter. How do I simplify and better invest what God has given me? I want this to be my year to get back to basics, and to do that, there are several areas that need simplifying. These are a few that I am thinking of right now. Belongings - By this, I mean my material possessions. This seems like a really surface level thing at first glance - how can simplifying my belongings help me invest my life better? I know myself, and I know that when my house is crazy, I can't focus. I think if I sat down and figured out how much time I spend just taking care of all our stuff, it would probably be really depressing. I would love to get rid of the extra things that it seems I am constantly battling, and organize the things we actually do use. My hope is that I can think less about keeping the seen things in order, and think more about the unseen things that really matter. Finances - I think this topic deserves a post in itself, but I have been really convicted lately that I have not been handling my finances well. Budgeting is not something I am great at, but it's worth the work to improve, because I so want to be a good steward of the resources God has given me. Bible Study - This past year I have not been doing well with managing my time, and in particular, finding time to spend in God's Word and prayer. I can't adequately invest in others when I am not continually being filled up with God's grace and truth, and for that I need time every day to read my Bible and "come boldly to the throne of grace". To do that, I may need to sacrifice some things - sleep, "me time", or something else, but I think this is more important. I am not good at keeping things simple - I complicate things. I make things overwhelming, and then I end up not doing the things I want to do because it's all just too stressful. So this year, I want to simplify and refocus on unseen things. I am not expecting to immediately feel successful, because the truth is, simplifying will take a lot of work. I am not expecting to get to the end of 2015 and look back at a simple year. But I am hoping that by the end of the year, I am left with a simpler existence that will allow me to have "extra". Enough extra that the next time I choose "invest" as my word, I will already be set up to be successful. Do you pick a word for the year? I'd love to hear yours if you want to let me know in the comments!